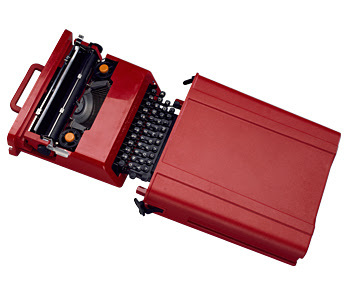 "Sottsass designed the Valentine portable typewriter to have a casual ease and appeal. Scaled smaller than traditional typewriters and lighter in weight than most portables, the Valentine proved to be as pragmatic as it was visually striking. Intended by designer and architect Ettore Sottsass to be the “anti-machine machine,” the Valentine made a vivid statement in a market dominated by somber appliances. The colorful plastic casing brought a sense of emotion to the typewriter, serving to differentiate it in store windows and newly inspire the literary crowd - IDEO selects"